The first Goosebumps 2 trailer has arrived to wish everyone an early Haunted Halloween. Slappy, the walking, talking dummy is back to wreck havoc on small town America in this sequel to the horror comedy hit based on the books of R.L. Stine. And it looks like one fun time for the entire family this October. Sony Pictures dropped this first look at Goosebumps 2 as a surprise. The follow-up continues the story first told in the hit 2015 release Goosebumps. This time, Halloween is coming to life in a brand new adventure that brings some of R.L. Stine's scariest creations to the big screen, direct from the pages of his 400 million selling series of YA horror novels. This time out, we're getting a new cast of kids and adults. Ken Jeong (Crazy Rich Asians) joins the series alongside Wendi Mclendon-Covey (Bridesmaids), Chris Parnell (Hot Rod) Madison Iseman, Ben O'Brien, Caleel Harris, and Jeremy Ray Taylor (IT). Jack Black, who played R.L. Stine in the original, is back to voice Slappy the dummy. Ari Sandel directs the sequel this time out, working from a script by Darren Lemke. It's expected that the cast of the original movie, Dylan Minnette (Prisoners), Ryan Lee (Super 8) and Odeya Rush (The Giver), all have secret cameos and will be back to help the new kids save the day. Based on Scholastic's worldwide best-selling book series, with over 400 million copies in print, the first Goosebumps saw the magical monsters from the pages of the Goosebumps books unleashed on an unsuspecting town. The first film made $156.7 million on a $58 million budget, and hit #1 on the sales charts when it was released on home video. A big part of the reason for that success was Jack Black. In this new trailer, it doesn't look like Black will be back to reprise his role as famed author R.L. Stine. But it was widely reported in December 2017 that Black was coming back to play the writer and voice Slappy. He's nowhere to be seen in the trailer. And like the older kids, it's expected that Stine will show up in the last third of the movie to help contain his creations and save the town from a complete monster takeover. 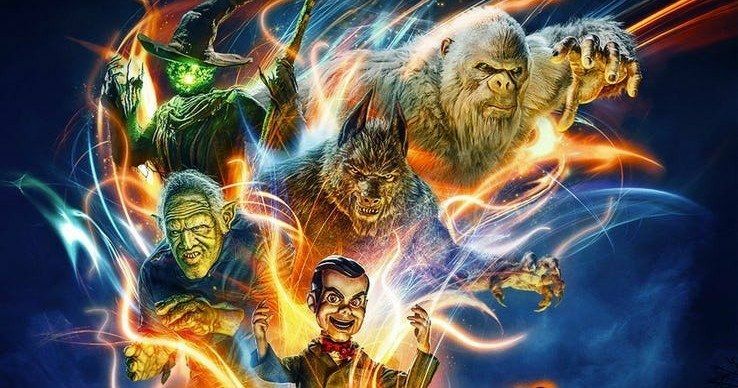 Goosebumps 2 which is being called Haunted Halloween, is arriving just in time for the holiday, debuting in theaters on October 12. You can check out the first trailer from Sony Pictures along wth the official poster. Can Venom Fend Off First Man and Goosebumps 2 at the Box Office?